Blue Cheese Mac and Cheese. I feel like it’s mac and cheese season. Is it mac and cheese season? I don’t know. I’m just making that up. But I’d like to declare it mac and cheese season because I’m sort of over winter and with 20 or so days left? I’m done. Mac and cheese season it is. And since I’ve nearly exhausted all the other options for fancy mac and cheese, I’m showing you some with this gorgeous specimen above. I adore blue cheese. While I normally prefer it crumbled lightly on top of something or mixed with my favorite flavor combination of sliced scallions, chives, cilantro and parsley, this blue cheese overdose was just right. I used a mixture of gorgonzola and buttermilk blue, but you can use any kind of blue that you want. Use your favorites blues! Get rid of the blues. Just imagine this piled high next to a perfect filet. !!!! I need to make that happen this weekend. Okay so listen up. In order to enjoy this? You really need to like blue cheese. I mean, really. I KNOW. So annoying. However, this is for all of my fellow blue cheese lovers out there. If you are going to ask me what you can sub for the blue cheese since you don’t like it… ummm, how about just make an entirely different recipe? Not to be a big meanie, but this is, like, totally focused on blue cheese. 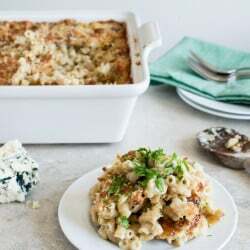 If you don’t like to eat mold, you can try your hand at this four cheese skillet mac, beer mac and cheese, white cheddar and arugula pesto mac, mexican mac and cheese, buffalo chicken mac, stovetop BBQ chicken shells and cheese or even this lightened up butternut squash mac. See? Problem solved. No subs needed. And I guess I sort of have a thing for mac and cheese. But seriously, who doesn’t? Bring water to a boil and prepare pasta according to directions, shaving 1-2 minutes off of the cooking time. While pasta is boiling, heat butter in a medium saucepan over medium heat. Once sizzling, add flour and whisk constantly to create a roux, until golden and bubbly, about 2 minutes. Pour in milk and whisk constantly, stirring until the mixture slightly thickens. Reduce heat to low and add in 6 ounces of the fontina, all of the gorgonzola and about 6 ounces of the other blue. Stir until cheese melts and sauce is thick. Taste and season with a bit of salt and pepper if desired. Add noodles to the baking dish. Pour cheese sauce over top, tossing to coat all the noodles. Sprinkle remaining fontina and blue over top evenly, then cover in breadcrumbs. Bake for 30-35 minutes, or until top is golden and crunchy. P.S. I pretty much ate the entire crispy top off of this. Single-handedly. Oomph. It’s totally mac and cheese season. And I am making this this weekend, no excuses. Oh my…I am so making this. Blue Cheese & Me sittin’ in a tree…, k-i-s-s-i-n-g…! Love me some Blue Cheese Mac & Cheese! Love blue cheese and so does my hubby! Read your no substitutions comment to him and he thought it was hilarious! Stand by your cheese! I am sorry but I have a huge dislike for Blue Cheese but this recipe looks to good not to eat. Maybe it will change my mind. Fingers crossed. Oh, but I’m so madly in love with cheese, any kind of cheese, that I’m flying to my kitchen right now to make this recipe. So mac and cheese it is! We do Gorgonzola around here; I like a nice blue cheese but my girls never have so just got used to using Gorgonzola, sort of my own ‘blue cheese lite’ if you will. I’ve got some nice grass fed rib-eyes that a Colorado farmer gave to me; perfect yes? Oh dear god in the blue cheese heaven above….I am SO making this tonight! I ♥ you…..I do I do I do!! Will let you know how it turns out and if I get “extra” lucky tonight with the hubby for making it…he is after all a true LOVER of blue cheese!! :) Thanks for posting!! Not only was this a HUGE success at dinner on Sat night I had to make it again Sunday as our friends kept the leftovers and my hubby was oh so sad!! We added maple bacon to the cheese sauce …yes I said it….BACON!! :) WOW is all I can say!! Cant’ wait for leftovers tonight! Thanks again for posting. omg you are reading my mind! i just discovered my love of blue cheese on valentines day! MMM still dreaming about that burger with fried kale, tomato pesto, and YUM BLUE CHEESE. ive been looking for a recipe to fix my sudden need to have blue cheese on everything, and I think this is it!!! 1. It’s always mac and cheese season over here. 2. Blue cheese is fabulous!!! you are my favorite foodie blog and I always think “she would totally be my best friend” and this was the icing on the cake/ The photo of the cheese poured on the noodles w “This is embarrassing” absolutely love it. Can’t wait to try it…for now pinning it along with 3408 of your other recipes!! I laughed so hard when I read you ate the whole top… It’s on the stove right now, thanks! I am one of those crazy blue cheese fans so this sounds and looks amazingly delicious! I can’t get over the crunchy top! It looks sogood. I hope no one else is into blue cheese- more for us! This was so amazingly delish! i love ALL your recipes but this one was a huge hit with my hubs :) I added shredded chicken too and it was so good. Thank you for sharing your recipes with us all!! 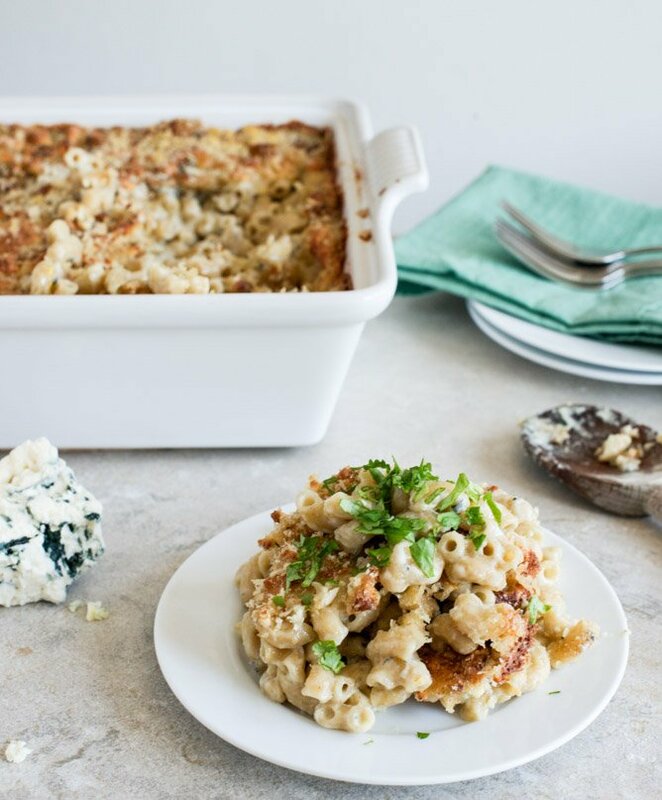 Agreed…if you don’t like blue cheese, just make regular mac! You have to try making it with the steak as that just sounds too good. I would just put a big pile of mac on top and sink my fork straight down–YUM. Also, if you are looking for a really rich blue cheese, Castello Danish Blue is very creamy and has a true blue flavor. We usually melt it right on top of grilled steaks, but I think it would also be great in this mac. I made this yesterday and it’s the most amazing meal ever. I could eat this for the rest of my life! Thank you for posting this!! To say that I enjoyed this would be an understatement. I have never been so excited about macaroni and cheese! I thought about this all day at work, and as soon as I got home, I started making it. It was so simple and SO delicious! I look forward to eating the leftovers the rest of the week and making it again soon. I’ll be trying more of your recipes, that is for sure! ahead on your subsequent put up, I’ll attempt to get the cling of it! This recipe turned out great! I also added broccoli to it. My boyfriend doesn’t usually go for meals that don’t include meat, but he loved this one! Yaay, This was tasting amazingly amazing! love it , a musttryy for everyone! Holy cow. I bought some lovely blue cheese from a dairy in Dublin, TX, and was looking for some recipes. Came across this one, and am I ever glad I did. This is phenomenal. Oh man.